We last looked at Monster Hunter Tri's play-time data 3-weeks ago, from August 16. With this week's data, I am including a monster hunt video I went on in the single-player campaign a few days ago. In the video, I'm hunting a Barroth. If anybody has hunted a Barroth, you probably immediately knew what I meant with "A Stick in the Mud!" in the title for this post. Monster Hunter Tri has 39,114 players reporting play-time data, an increase of 3,265 players since 3-weeks ago. Monster Hunter 3's average hours reported per person are now 76 Hours 26 Minutes, over 20.81 play-sessions. The current average Monster Hunter Tri game-play session, per player reporting data, is now about 3 Hours 40 Minutes. Monster Hunter Tri's average hours, the 76 Hours 26 Minutes "per person", have increased 4 Hours 58 Minutes, since 3-weeks ago. The game now has 2,989,625 Total Hours reported for game-play, an increase of 427,475 game-play hours since the August 16 Nintendo Channel data. Monster Hunter Tri's Amazon.com sale rank is #981, and the current sale price is $47.91. The sales rank #981 is the lowest recorded sales rank I have seen Monster Hunter Tri have since it released in April. Monster Hunter 3's review score average is still 85.00%, based on 46 "professional" reviews, on GameRanings.com. I have been playing Monster Hunter Tri's single-player campaign little, by little, in the last 2-weeks. As I mentioned in the "Quick Brew Info" section, I went my first Barroth hunt in the single-player campaign a few days ago. I had hunted Barroth online with The Butcher and Den before, but I had never progressed far enough to hunt it in the single-player campaign by myself. As for the play-time data, I believe Monster Hunter Tri will become the "most-player" Wii game according to average play-time "per person", within the next 3-weeks; passing Super Smash Bros. Brawl. 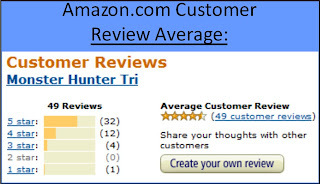 The low Amazon.com sales rank is interesting, though it could just be a very temporary rank and tomorrow it could be back up in the #400+ sales rank range it had been in previous weeks. Is anybody still playing Monster Hunter Tri on a regular basis? If so, what nights/times of the week would work best to try to get online for some monster hunting as a group? Still playing message me via twitter at xbluntforcex. I can hope on anytime you need me too. I'm rank 158 and played for 740 hours. This game really is the Wii's answer to an MMO. It's not quite there - having played it online it is a relatively limited and cold experience, but it's good - one of the better online experiences for the Wii. I still hop on when I can. @Chuckpebble, I've been searching for you online when I can.. when do u get online? I play regularly online almost every day. I'm currently at hunter rank 52. Last night, I saw one of the highest ranked players with a hunter rank of 420! I believe the player's name is Lilith. I've just surpassed 300 hours of gameplay time with 160 of those coming from the single player mode. A truly addictive game. Been playing less lately, but I do still play! HR 45 I think? I forget... But Butcher and I still get destroyed a lot :D! What HR are you now! Have you crossed into that 900 range yet? Thanks for the info! I'm going to play some single-player here in a bit, but I may hope online(late Friday 9-10-10); if I do, I'll send a message your way! "I'm rank 158 and played for 740 hours." Have you already been playing Samurai Warriors 3? It doesn't release here in North America until the end of this month. I have seen a few trailers for it, but most are the cut-scenes from the game, so what type of game-play does it have exactly? Hack-n-slash? What HR are you now? "I've just surpassed 300 hours of gameplay time with 160 of those coming from the single player mode. A truly addictive game." Wow, 160 hours in the single-player is awesome; I wonder how many hours it will take me to complete the main quests. It's been a long while since we have been out hunting...with my level 15 HR, you and Butcher shouldn't get destroyed at all with the monsters we would be hunting! Thank you all very much for the comments! I hope to get back in a normal routine soon, and get back to the online monster hunting.